Note a # at the front of a line of text means that it is commented out and is not checked by the package manager. If the error is due to a PPA - usually unticking the similarly named PPA with the URL shown in the error message will resolve this. If the 404 error was due to an additional repository that has been added to /etc/apt/sources.list then its easier to add # character to the start of the line to comment out the offending repository i.e. How can I fix a 404 Error using the Ubuntu archives? 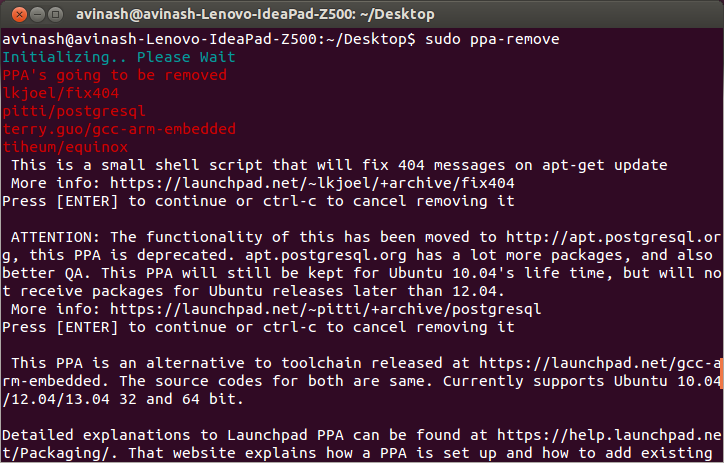 This is a script to remove automatically all the 404 Not found PPA's.Copy the below code and paste it into a file and name it as ppa-remove. Copy and paste the ppa-remove file into /usr/bin directory.So that you can access it from anywhere. [ -f /tmp/update.txt ] && sudo rm /tmp/update.txt; tput setaf 6; echo "Initializing.. Please Wait" || echo "No update file"
tput setaf 6 command turns the terminal text colour into green.And then it displays "Initializing ..Please Wait" in green colour. Awk searches for the line which consists of W:,launchpad,404 in the /tmp/update.txt file.If it found that then in that line it displays(stdout) all the letters starting from the 26th location in column5.This standard output was redirected(written) to the /tmp/awk.txtfile. awk findout out the column1 and column2 with the delimiter / where the column1 and column2 are concatenated by /from the /tmp/awk.txt file and then redirects(written) the stdout to /tmp/awk1.txt file. 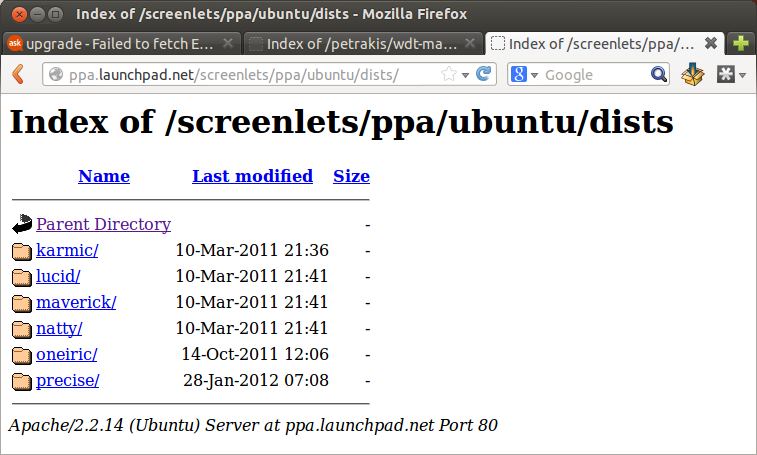 Now /tmp/awk1.txt file contains pitti/postgresql line. If there are two same lines, unique command displays(stdout) single line only.That single line was written to /tmp/awk2.txt Finally /tmp/awk2.txt consists of unique PPA names. This command changes the colour of terminal text into white. Finally if conditional statements will executes. if [ -s /tmp/awk2.txt ] check for the contents of /tmp/awk2.txt file presents or not.If yes, then it takes the first line from /tmp/awk2.txt and executes sudo add-apt-repository -r ppa:$line command.It continues upto to the last line. If no, it means there is no contents.So it says "No PPA's to be removed". You are getting these errors because your PPA repositories don't provide packages for your distribution of Ubuntu (ie; quantal). 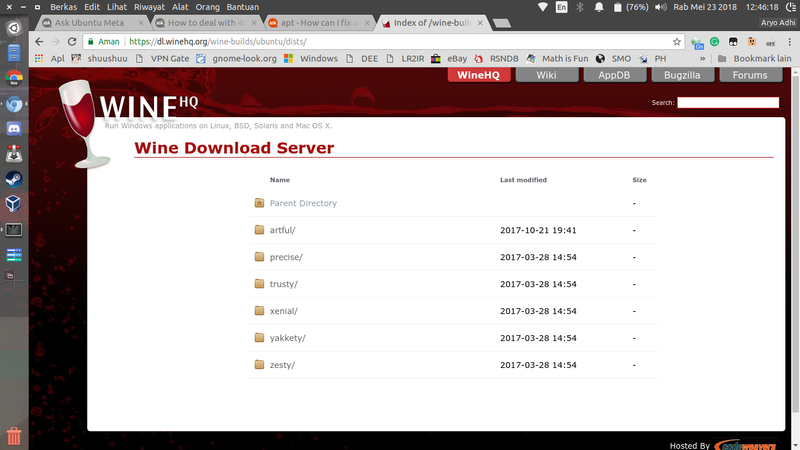 You can see that the directory for quantal is missing and hence you are getting 404 Not Found Error Messages. See the section called "How to eliminate these errors" in this answer. Or, How can PPAs be removed? How to investigate this and come to this conclusion? Open your browser tab and open the link which gives 404 Not Found Errors. 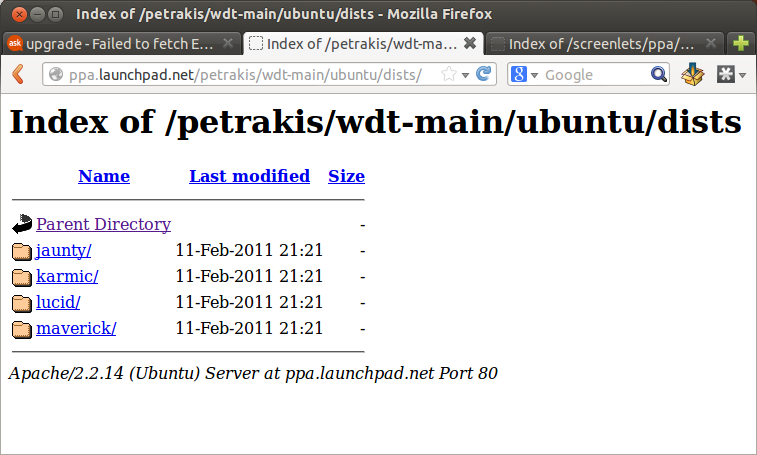 In this case http://ppa.launchpad.net/petrakis/ and go deeper as per the link which gives errors. You would be able to see what the actual problem is. If you're really need the packages from that repository, you can use the mirrors from older release. However, please note that not all older releases are backward compatible; some of them causes conflicts with your main package repository. 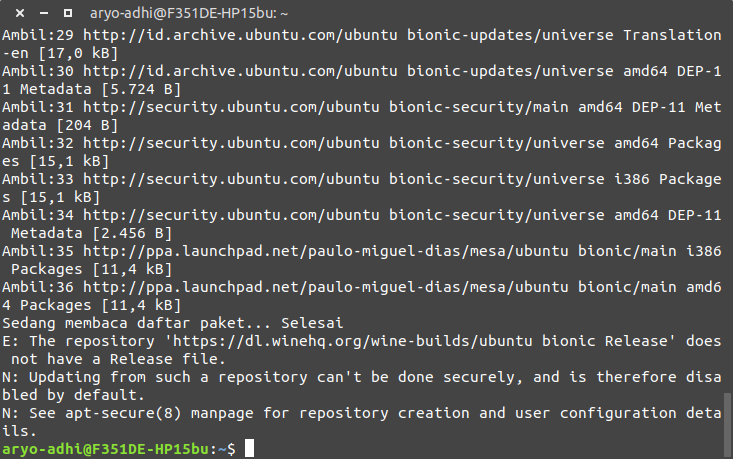 The only thing you can do when it conflicts is either building from source or wait until the provider releases the repository for your Ubuntu version. We don't know exactly when the package providers will release their package for our version, so you're the one in charge to check their repository for your release. 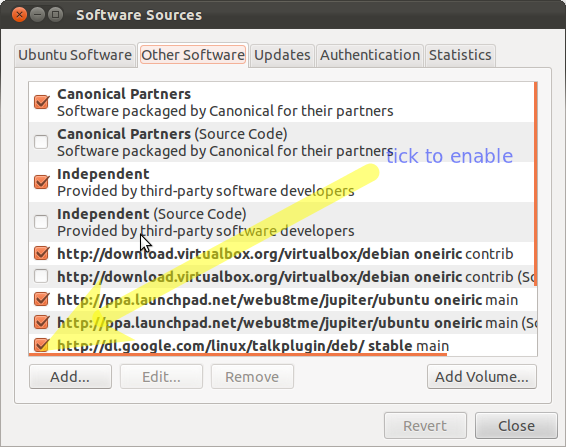 This can be used with any Debian-based repository. However, there is no guarantee that this will be successful. 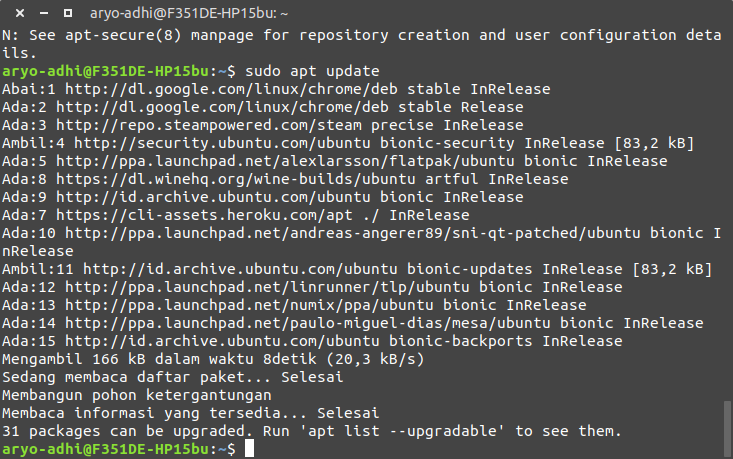 Do usual sudo apt update after adding PPA/repository. You can notice that there are 404 errors while updating; just ignore this. 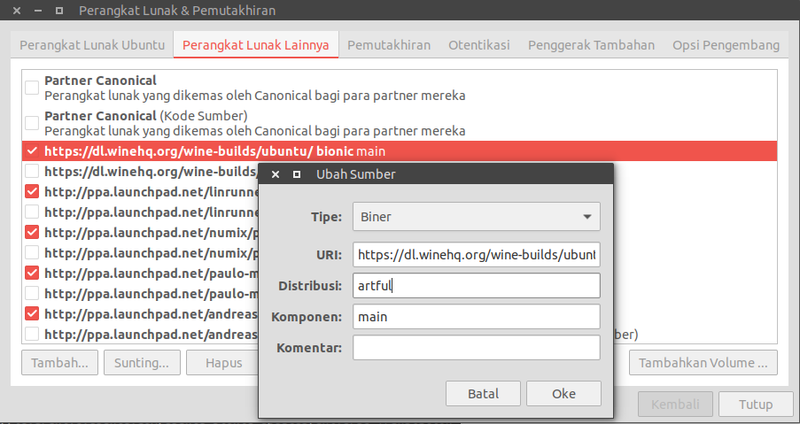 Open the repository directory which causes 404 error with your browser; in this case it is https://dl.winehq.org/wine-builds/ubuntu. Usually, available releases are located in dists/. After you located it, open Software & Updates, and replace your release name with the available release; preferably latest or LTS one. Replace 'Distribution' section in binary and source code mirrors. In this case, I'm replacing bionic with artful. Do sudo apt update again. You're done! Now you have no more 404 errors while updating your package lists. When the packages for your Ubuntu version is released, repeat step 3 and 4 by replacing 'Distribution' section with your distribution name. And suddenly it worked. Do not ask me why. If you are getting a 404 error trying to obtain security or system files from an official repository (not a PPA) you can chose a different mirror to resolve this issue. Either way you can start with the Software & Updates application as shown below: Then Select Download from followed by Other. Then you can either manually choose the mirror of your choice from the list or click the Select best Server button which will run some tests and choose the best server for you dependent on current conditions. I have tried every possible answer, but the only solution was to copy the Ubuntu 16.04 Xenial default /etc/apt/sources.list file to my /etc/apt/sources.list. Not the answer you're looking for? Browse other questions tagged apt ppa repository or ask your own question. How to remove a repository? How to I install a free NX server? bisig PPA causing 404 error? How can I fix a 403 Forbidden Error when using a PPA or updating my package lists? How do I fix 404 error when updating package lists?